Can a Felon Get a Drone License? Felons being released from prison may want to find a recreational activity like hunting, fishing, or flying a drone. Also, some may have an interest in flying a drone commercially. Felons often believe no one will hire them, but there are resources available as many employers have found that felons make good employees. 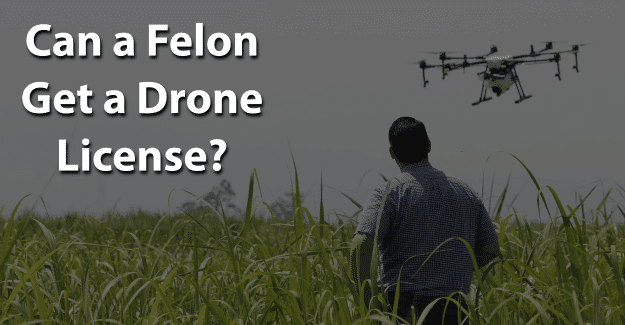 This blog post will address the issue of whether or not a felon can get a drone license. A drone is an unmanned aerial vehicle that is navigated manually with a remote control or operated with software that works with a GPS System. It is made of light materials to reduce weight and increase maneuverability. It’s also equipped with technology such as cameras, GPS, and lasers. An unmanned aerial vehicle system has two parts: the drone itself and the control system. The nose of the unmanned aerial vehicle is where the sensors and navigation system resign. Materials used in the construction of the drone are complex composites that can absorb vibration to decrease any noise produced. Drones come in a variety of sizes. The largest is used for military purposes such as the Predator drone. Next are those with fixed wings, requiring a short runway. These are typically used to work in areas such as geographical surveying and to safeguard wildlife from illegal hunting. Then there are vertical takeoff and landing drones (VTOL), many of which are quadcopters that can take off, fly, hover, and land vertically. The Federal Aviation Administration (FAA) has established guidelines regarding registration requirements for flying drones recreationally. Anyone flying a drone indoors does not need a remote pilot’s license and may not even need to register their drone with the FAA. If someone flies a drone outdoors for recreational purposes, he or she will need to register the device. There are two options for flying a drone recreationally. Basically, if someone plans to fly a drone in the field, park, or other open area where there are not manned aircraft passing through and there is no immediate threat power lines or people, he or she does not need a remote pilot’s license. That person will still need to register the drone and ensure that is only being used as a hobby, however. A passing score is 70% on the exam. Commercial drone pilots must undergo a criminal background check before legally operating aircraft in U.S. airspace. A pilot must receive a security threat assessment background test from the TSA before being allowed to operate. This is the same background check used to screen pilots and airport security personnel. Having a criminal record is not an immediate cause for denial of a license. A criminal background check is handled by the Transportation Security Administration (TSA). Those convicted of a felony fall into two different categories. For those falling into any of these areas, they are permanently prohibited from getting a drone license regardless of when the crime occurred. Then, there is a second category of felonies. This class of felonies is termed interim disqualifying criminal offenses. These are ones for which felons were convicted within seven years of the date of the application, or if the applicant was released from prison after conviction within five years of the date of the application. In order to be successful in their pursuit of getting a drone license, it’s essential for felons to be honest about their background. They are already working with the negative perceptions of being dishonest, untrustworthy, and unwilling or unable to follow directions from authority figures. There are re-entry programs, such as drug treatment, and educational opportunities for felons who need them. For many felons, having their felony expunged can give them the chance they need to begin with a clean record and succeed in getting a drone license. Having their record expunged will permit a felon to be able to honestly state on a drone license application that he or she has not been convicted of a felony and increase the chances of success. It is a significant challenge, but it might be worth it for a felon that wants to get a drone license. Having his or her record expunged and also documenting any training programs or additional education could make the essential difference in a felon succeeding in getting a drone license. What do you think about this blog post? Have you or someone you know been in the situation of trying to get a drone license with a felony? What was that like for him or her, and how did he or she achieve success? Please tell us in the comments below. I’m a felon from the mistakes of my past. Multiple DUI’s got me into some trouble. Right now I’m actively involved in setting up my Drone Business in Alaska. Thanks for the info.